Mid-brown beer hopped with noble German hops. Medium-bodied, moderate levels of bitterness and a balanced finish. Somewhere between English brown ale and German Alt-Bier. 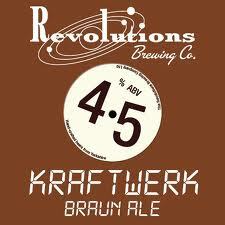 This 4.5% beer comes from the Castleford based, Revolutions Brewery, where they pay homage to music from the analogue age, before digital and downloads. All of the names of their ales also come from music and they produce special brews to help promote brands. As it says on their website, love music, love beer. This is definitely not your usual real ale and as mentioned above it does taste a bit like a German beer, but is dark and tasty without tasting like a stout, as it’s only 4.5%. So it’s not a heavy drink at all and it has a very mild bitter aftertaste. It’s very tasty and something rather special in my opinion. Another thing I really liked about it is the more real ale I drink, the more I think about brewing as a science. To me the brewers are wizards or chefs, conjuring up the perfect pint, with a drop of this, a pinch of that, and two spoonfuls of something else. I know there are real ales like this one out there, and as a fan of dark ales and ruby ales I’m going to come across all of them sooner or later, but even so, they will be slightly different. This is because the brewery has approached it from a slightly different angle, and even with the same ingredients two brewers would produce something slightly diffferent. Anyway, Revolutions Brewery has some great real ales and they love their music, so if that sounds like your sort of thing then check them out.